The Mulberry Kisses pastel toned design and pretty butterflies, adds the perfect touch to your box. With our free, downloadable template, you can resize it to whatever fits your gift - lovely! Print our free downloadable template and place on top of your chosen 12x12 design. Ensure to have your design facing out when assembling. Cut out your template. TIP: Remember to score the lines on top of the box. The straight lines score as a valley fold so they will bend inwards. The curved lines are the mountain folds. Once it’s scored, it will create a pretty, floral opening. Start assembling your box, from the bottom upwards. Use Perma-fix tape to put your box together. If filling with sweets, ensure to fill your box before closing at the top. 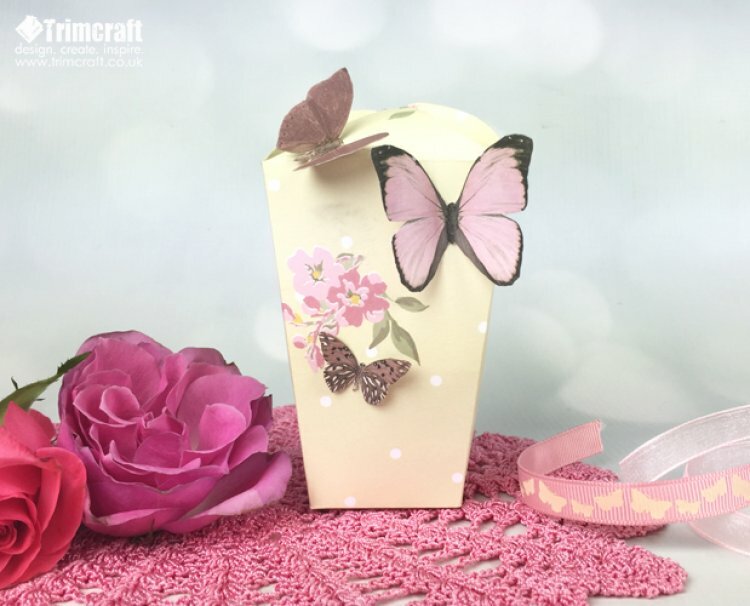 Glue a few butterflies from the Mulberry Kisses collection, make sure to fold a few in half before sticking to your box, to give them dimension. This is a versatile design that will sit pretty on any surface. It can be filled with a variety of things from your mothers favourite sweets to written memories of your time together. Upload your version to our project gallery.